ORMOC CITY- The town of Tabango in Leyte has not just put up a landfill where wastes are to be dumped turned it into an ecological (eco) park to make it more productive. In 2016, the local government has put up a landfill in Barangay Manlawan, seven kms away from the town proper, where wastes are to be deposited and processed in compliance to Republic Act 9003, otherwise known as the Ecological Solid Waste Management Act. 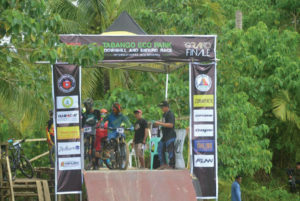 The municipal government, under Mayor Bernard Jonathan Remandaban, packaged the area, all of three hectares, not just a mere dumpsite but into an eco-park where tourists could visit or as a venue for sports competitions. “Who would come here if this will just a dumping site. Brgy. Manlawaan, where the eco-park is located, is the most populated barangay in Tabango. At first, the villagers were against the idea of having this landfill here. After I presented them the whole idea, they approved it and they were happy even for the initial turnout,” the town mayor of Tabango, 50 kms away from Ormoc City, said. Since the entire area is generally mountainous and steep, it was landscaped by putting ornamental plants and as a way to avoid soil erosion or landslide. Remandaban said that they are planning to put up a restaurant in the area, to be operated by an accredited civil society organization, a 16-room hotel equipped with a clinic, souvenir shop and a spa. The construction of the planned hotel will be funded by the local government unit, the town mayor said. A zipline and a sky bike, in addition to the currently operational wall climbing, will also be put up inside the eco-park. And to make the eco-park ‘more lively,’ sports events are to be staged there, Remandaban said. Early this month, it served as a venue for bicycle endurance competition participated by foreign competitors. “My travel to other countries with my wife, former Mayor Maricor, gave us the idea of having this in our town and maximize the rich resources that we have which is the nature. At the same, it is our way of raising advocacy in preserving the environment and reduce its abuses”, he added.